and several others, like LXC support, under discussion. You can contribute code to any of these add-ons, make a new add-on, or join the discussions in the development mailing list. The OpenNebula Project announces the general availability of the second Service Pack for the OpenNebula 3 Series (3.8.5). After its first year, and for two additional years, the Project distributes a Service Pack (SP) for each major release that combines all the patches to easily install or deploy its last update. Service Packs allow users to maintain their current OpenNebula version as long as possible, preserving the stability and security of their data centers, as they transition from one OpenNebula Series to the next. This is a maintenance release that fixes bugs reported by the community after 3.8.4 was released. This release only includes bug fixes and is a recommended update for everyone running any OpenNebula 3.x, whom for any particular reason do not want to upgrade their cloud manager to the latest available OpenNebula version. OpenNebula is an awesome cloud manager because of great contributions made to it by community members like you. This is the reason why one of the most important discussions in the Open Session of our first OpenNebulaConf in Berlin was focused on bringing more visibility to the different ways you can help with in the development of OpenNebula. Our aim has been to make processes more simple, transparent and collaborative, and set clear expectations. Supported through the OpenNebula users mailing list. These collaborative development tools will provide contributors with an environment to introduce and give visibility to new add-ons, and to reach new developers and early adopters that can help shape and test these new components. We invite you all to join the new developers mailing list and to submit your add-ons to the new catalog! 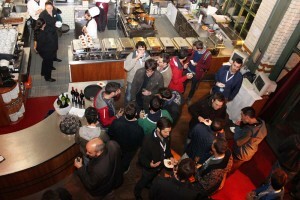 A very good atmosphere was created and breathed by all the participant at the OpenNebulaConf 2013 last month in Berlin. Hugely interesting, techie chats were held all over the place in small groups, with people taking the chance to explain how do they use OpenNebula in their infrastructures to build the IaaS layer that they want, not the one that the Cloud Management Platform imposes. That is the great thing about OpenNebula’s modular architecture. So if you want to remember the great ambience of the conference, or if you haven’t got a chance to attend, here is your opportunity to (re)visit the knowledge shared in the conference in the form of recordings of the keynotes and talks. Also, you can check out the presentations of the speakers if you want to consult a particular detail that you do not quite remember. And, to make the experience even more immersive, scout through the conference pictures. All the above is great, and you will feel almost as if you were there if you didn’t. And we say almost because, as CentOS project director, Karanbir Singh, said, the real value of a conference is what happened behind the scenes, between talks, during the fantastic evening event. So, if you liked what you just saw, make sure you save the date for 2-4 December, 2014!. Belated due to the OpenNebulaConf, here’s our monthly newsletter, with the main news from the last month, including what you can expect in the coming months. The OpenNebula team is readying the next release, OpenNebula 4.4. We can advance cool features like support for multiple system datastores, improved Open vSwitch integration, better xmlrpc concurrency, support for IP reservations and many other nice improvements. Check the development portal for the full set of features and bugs to be dealt with for OpenNebula 4.4. One of the most useful (and most difficult to implement, at the same time) feature would be multiple group functionality, with an approach mimicking that of unix groups. Please check this blog post to get a peek on the upcoming feature. Moreover, driver enhancements are also underway like for instance, improved hybrid support for EC2. Expect lots of new enhancements to the unique OpenNebula hybrid cloud model: higher performance, more robust and effective monitoring, etc. Also, the implementation of the EC2 API in OpenNebula to build public clouds will be greatly improved: snapshotting, tags and improved describes. Ceph drivers will also be revisited to fix bugs. Many of our users asked how to configure OpenNebula for High Availability of the front-end. We’ve created a step by step guide on how to achieve this configuration for production environments. OpenNebula wouldn’t be the same without the feedback from its amazing community. The development portal is always buzzing with new bug reports and patches from open bug tickets. Help with package maintenance is always more than welcome. For instance, Shawn Starr’s contribution announced in twitter is a great contribution to the project, since its fosters the distribution of OpenNebula by giving better support in the Fedora distribution. In the same line, we are extremely grateful to Robert Schweikert for his excellent maintenance of the openSUSE OpenNebula package. It’s always nice to learn that also other open source friendly projects like CentOS. This month we learned that CentOS distro test infrastructure is powered by OpenNebula 4. Yay, way to go, CentOS! Awesome users lead to awesome contributions. We’d love to hear about stretching OpenNebula functionality to limits beyond its original design (ie, things we never thought about). Check out Carlo Daffara running Android under KVM using OpenNebula (with ARM emulation and OpenGL). Another even more important contribution by Carlo has been summarised by him in this blog post, on how to provision virtual desktops using OpenNebula. We also want to give a warm welcome to two new technology partners, Terradue and Viapps, which enrich the OpenNebula family integrating with it and providing new, enriched functionality. Last month we held the first OpenNebula Conference, based in Berlin between the 24 and 26 of september. The conferenced served as a meeting point for OpenNebula cloud users, developers, administrators, builders, integrators and researchers and an unique opportunity for discussion and collaboration with other projects. We are very proud of the conference, where the speakers were of very high quality and with spot-on topics, and the hallway track was marked with very interesting OpenNebula use cases. And it is not only us saying so! Check these GigaOM and Euro Nova posts. You can check out the slides used for the tutorial given the day before the actual conference kick off. Recordings of the conference talks, as well as PDFs, are being readied as this is being written and will be available during this week, so stay tuned to the OpenNebulaConf web page! Next year’s conference will be held in Berlin as well, 2-4 of December, 2014. If you want to repeat or find out how it is for yourself, save the date! A very interesting event to held in the following following month is the C12G organised CentOS dojo. Next month, November 8, in Madrid, Spain, a very good array of speakers (including CentOS director and OpenNebula developers) will shed light on OpenNebula, clouds and CentOS, at the C12G Labs HQs. Viapps has just announced its partnership with C12G Labs to develop an integration between Viapps and OpenNebula for the automatic creation and management of virtualized infrastructure services like Firewalls, DNS/DHCP/NTP Servers, HTTP Proxy, SMTP Gateways and IP LoadBalance on cloud environments. Viapps is an opensource automation life cycle solution of infrastructure services on cloud environments. It allows to create, install, configure, update, manage, monitor and audit several network infrastructure services, using opensource components like Chef Server, Mysql, … Extensible, new functionalities can be incorporated through new modules development. It is based in a RESTful API, allowing it to be integrated with third party platforms. More information in Viapps’ press release.